If every time you have to fly, whether it’s business or personal, you start to cringe days, or even weeks before the flight, you’re a fearful flyer. Anxiety settles in long before your bags are packed, and obsessive thoughts of all the things that could go wrong while sitting on a plane for a few hours invade your head. You might be a fearful flyer if… You’ve missed important meetings or business opportunities. You might be a fearful flyer if…You decide to drive, even though it will triple travel time. You might be a fearful flyer if…You lose out on seeing family more often, or vacations together. You might be a fearful flyer if…You fly, but it’s physically and mentally draining on you, your family. Do any of the above sound like you? If so, you’re not alone. The good news is that the fear of flying is one of the most successfully treated phobias out there. Captain Ron, airline pilot for over 30 years, is here to help you. Private coaching is THE most effective treatment for fear of flying. It’s personalized for you, to find the things that trigger YOUR fear, and get answers on how to control your anxiety, without drugs. Captain Ron works one-on-one with you, and with his training in Professional Counseling, quickly develops strategies that work for you to finally get back onboard worry-free. Will Coaching Help Me Overcome Fear of Flying? Coaching is not for everyone. Sometimes people just need a little push in the right direction to get over their fear. However, others are too deep in the “fear cycle” to get out on their own. To see if Coaching is a good option for you, click the yellow button below to schedule a free 15 minute consultation with Capt Ron. Count on his honesty and professionalism to give you his best advice on what you need to do to finally stop being afraid to fly. Overcoming fear of flying is a process. Don’t fall for any promises of a quick fix: “Buy my product–self-hypnosis DVD, NLP techniques DVD, etc!” Unless you have the resources–time and money to fly regularly–your fear will try to “reset” in the intervals between flights. This involves committing time to educate yourself on the myths and mystery. Fear really does come from the unknown, and for most people, just learning how such a big “hunk of metal” somehow defies gravity to safely takeoff, climb, cruise, and land as routinely as a car drives. With the exception that planes are MUCH safer! Although it might sound like a “quick fix,” most people need something to distract their minds from catastrophic thoughts and feelings. I highly recommend using audio stimulation, such as an audio book or podcast on an interesting subject. The FearlessFlight Harmonizer was specifically designed to draw your attention and creatively crafted with content that is relevant to your flying experience. It is said that our secrets are what kill us. An overwhelming number of fearful flyers suffer additionally from shame and embarrassment thinking they are the “only one” afraid to fly. One of the most noticeable benefits I see in all my classes is the realization that they are not alone in their fears. The FearlessFlight.com community complemented by an active Facebook page is a place where people can share experiences and ideas. Connection is the biggest benefit of being human. 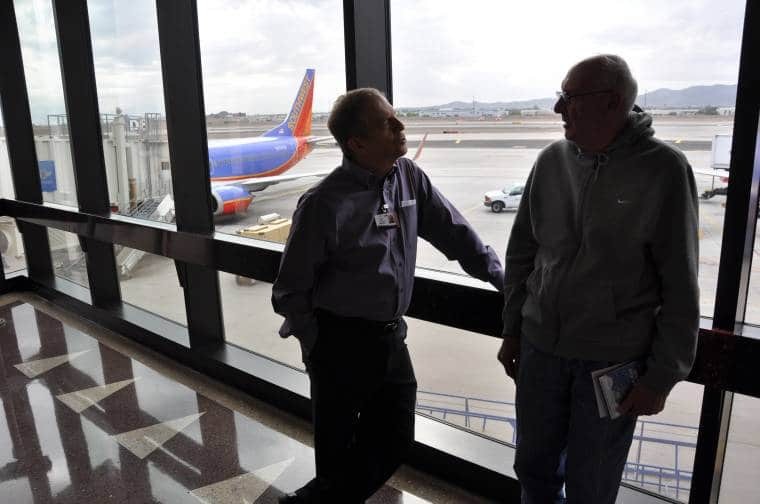 Capt Ron engages with a fearful flyer before boarding a flight for the Cleared for Takeoff 201 Advanced Class. The first 15 minutes is a free introduction to see if coaching is 1) relevant and, 2) a good fit both the client and the coach. The coaching usually takes place over the phone or through a private web meeting, but can be in person, too. We offer the option to record the coaching session so you can go back for a refresh anytime you need. Most people benefit most from usually just one or two coaching sessions to learn the strategies and techniques that will permit them to move to the next level. The end goal is to get on a plane with a significantly greater level of confidence and less anxiety. The amount of positive feedback that I have received over the past 31+ years contributed to this evolutionary process that I use today. It’s incredible to see the power of the mind, pressing through horrendous fear, just by having an effective coach to talk with. Early in my studies to learn about Professional Counseling, I learned one of the keys to effective coaching: someone to listen with compassion and unconditional positive regard. Of course, I answer all your questions about things that go “bump” in the flight, but it’s having someone create a “safe space” for you to to explore your fear, and how to be free from it. In response to all the gratitude I receive, I make it a point to remind my clients that it was they who took the first step, a step that continues to inspire me to be a better coach. Don’t live with the agony of fear of flying one more moment. Take that first step to begin YOUR journey to FearlessFlight. Although coaching is the most effective way to overcome your fear, it is not for everyone. Sometimes we find flyers that just need a little direction, as opposed to a formal coaching session. The FearlessFlight Harmonizer – tool to listen to up to and during the flight. Digital downloaded class – debunks the myths about flying and teaches how to identify unfamiliar sights, sounds and sensations that can trigger anxiety, sometimes leading to panic attacks.